A 3D Broadway Collectors Pin! On the Tenth Day of Fazzino, we offer to you…20% off Charles Fazzino 3D Collectors Pins. The perfect gift for the Broadway fan. 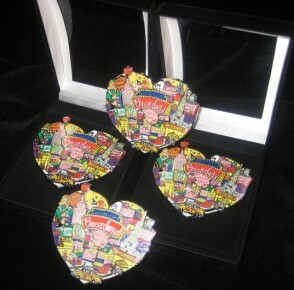 Each pin is built out in three layers and based on the vibrant Broadway-themed artwork for which Charles Fazzino is most famous. Each pin measures approximately 3″ x 2.5″, and comes in a beautiful display gift box. MUST ORDER BY December 18th for Christmas delivery. Plus, we’re giving one of these pins away for FREE. Just post a comment on this blog or on the Fazzino Facebook Fan Page answering our holiday question of the day by midnight tonight and you’ll have the chance to be our randomly selected winner. Visit the Charles Fazzino Gift Shop for even more holiday gift ideas and stay tuned for tomorrow’s Day Eleven Featured Gift of the Day!